Case measures 174 mm x 279 mm x 37 mm and is made from satin black ABS. Choice of knob colour schemes (e.g. blue cap verniers) will be available. 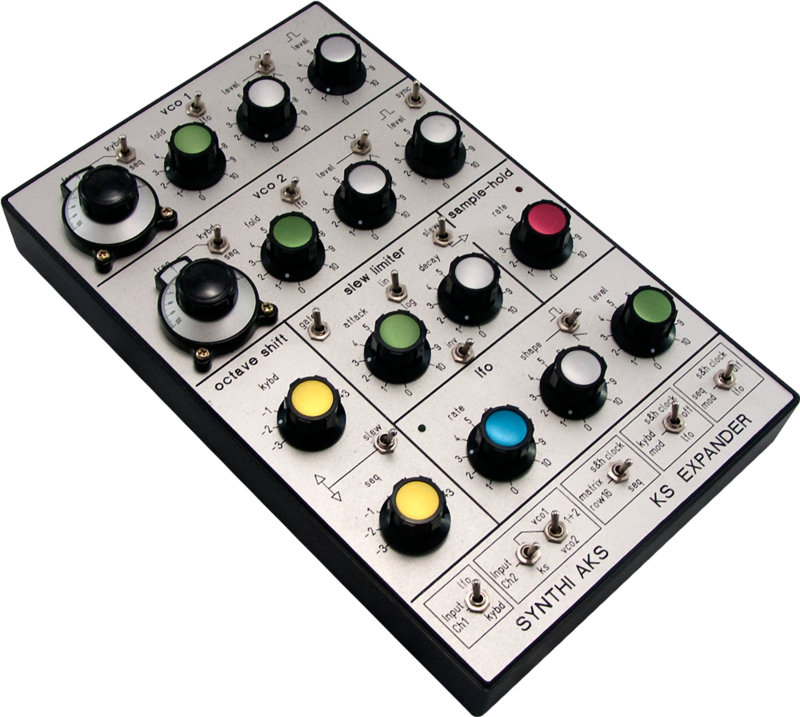 The Synthi AKS KS Expander is a new 'Expansion' unit for the Synthi AKS Keyboard Sequencer (KS). It could work equally with an EMS TKS (the version of the KS EMS made as a stand alone unit to be used with a VCS3 Mk2). In fact the prototype was tested using a KS connected to my VCS3 (Mk2). The KS is a great feature of the Synthi AKS and while it's no shakes compared to modern hardware sequencers, it's what makes the Synthi AKS arguably the most desirable of all the portable Synthis. What the KS offers is three channels of CV into the Synthi Matrix: two pitch CV channels via Input Ch 1 and the Seq Input (the latter recordable via the sequencer, the former real time via the touch sensitive keyboard). In addition to a dynamic envelope CV via Input Ch 2 whose amplitude varies with how hard the touch keys are played. What is lacking from the KS compared to the EMS DK1/2 is the additional VCO that is a great feature of these keyboards. Whilst comparing a KS with a DK1/2 is hardly fair, I thought it would be great to be able to add additional oscillator(s) to the KS, available to the matrix via a switchable option on Input Ch 2. This was the starting point of the project but as is often the case the project quickly develops into something bigger and one quickly thinks of other features such a 'KS Expander' might have! Of course there are many voltage processing effects besides additional VCOs, one can imagine adding Sample and Hold, Slew Limiters, Inverters, Octave Shift etc. etc. In order to constrain things a bit and focus the project, I decided to see what I could cram into the standard 'trapezoidal' case used for the various Synthi AKS interface modules I make. One can imagine much larger expander units that can interface with the Synthis (both AKS and VCS3) via the prestopatch socket with a host of features like additional filters, oscillators, EGs etc. That is something currently in development, but I thought that a compact (if less featured) expansion unit would be attractive to those lucky enough to own a Synthi AKS. Two VCOs each built around the high spec Exar XR-2206 ANALOGUE waveform generator IC. Each VCO features sine and triangle waves and 'wave-folding' (voltage controlled) that adds higher harmonics/distortion to each waveform for amazingly rich and varied timbres... even unfiltered! Each VCOs' frequency is controllable via CV from either the keyboard (which is also available to the matrix via Input Ch 1) or the sequencer CV (also available via matrix row 16) of the KS or 'free running', selectable via a 3-way toggle switch. Frequency range of the VCOs is very wide, from LFO to high frequency audio. High spec matched transistors are used (MAT02) for the exponential converters in each VCO circuit. Synching of VCO1 to VCO2 is also implemented in a unique fashion based on a clever property of the XR-2206, that of 'phase sensitive amplitude modulation'. Effectively this gives a synching of the wave-folding of VCO1 by VCO2 rather than hard synching the core oscillator in VCO1. Front panel pots control initial frequency, amount of wave-folding ('shape') and level of each VCO. A modulating triangle waveform is available (speed controlled by the S&H clock speed pot... see below) via toggle switches, to modulate the wave-folding of VCO1 and VCO2. Furthermore VCO1 can also act as a source of vibrato which can be applied independently to either keyboard or sequencer pitch CV from the KS. An additional new feature allows any Synthi waveform or CV to modulate wave-folding via the special pin cable. The mixed VCO1/2 combination is available via Input Ch 2 of the matrix. These additional VCOs mean that 4-oscillator (if we include Synthi osc 1/2) patches tracking chromatically over several octaves can be created for extremely fat sounds! Even 5-oscillator patches are possible if your Synthi has the hi/lo mod on osc 3! Or the additional VCOs can be used as LFO modulation source(s) via Input Ch 2. The unit allows, for example, the KS keyboard to control the pitch of Synthi Osc1 and 2 via Input Ch 1 and at the same time play CV sequences back just through the additional Expander VCOs 1 and 2. These are just some obvious new possibilities offered by the Expander VCOs... there are many more if you experiment. Slew Limiter (SL) with separate control over the amount of slewing applied to a rising or falling input voltage ('attack'/'decay') by front panel pots. Slew limiters like this are very versatile processors. Input/output to the SL is via a (blue) EMS pin on the special pin cable that plugs directly into the matrix, the matrix row being the input source and matrix column being the output destination. Thus any source voltage/waveform from the matrix can be slewed before being routed to an output. The slew rate is switchable between linear/logarithmic response. The latter allows for long slew times. Obvious applications of the SL are adding portamento (glide) to pitch CV, or to an LFO to get long attack/decay modulation envelopes and slewing of the trapezoid envelope generated by the Synthi Envelope Shaper etc. The SL also has an invert toggle switch that inverts as well as slews the input. With attack/decay levels set at zero the SL can also thus act as a standard voltage inverter. There is also a toggle switch that disconnects input into the SL via the pin cable and instead feeds a gate pulse triggered by the KS into the SL input. The subsequent slewing of the pulse gives a basic variable attack/decay envelope (with inversion option) as a useful additional modulation source for the Synthi. This envelope is available via the tip of the blue patch pin and can be applied to any destination matrix column. Finally there is a toggle switch that allows direct linking of the SL output to the Sample and Hold circuit which is described below. Sample and Hold (S&H). Standard LF398 based S&H with variable clock (panel led shows rate). Input/output is again via the pin cable (red pin) plugged anywhere into the matrix to select a source and destination. In addition there is a toggle switch that links the output of the Slew Limiter into the input of the S&H. This effectively produces a S&H with variable slope slew/invertible input. Insertion of both the SL and S&H pins into the matrix is needed to operate in this mode, with the input source chosen by the row the blue SL pin is inserted; the output destination is the column the red S&H pin is inserted into. This is a very useful combination to produce 'staircase' waveforms for modulation. For example, the filter or producing chromatic pitch steps, from e.g. pitch CV (up or down staircase using inversion) or osc 3 triangle (up/down staircase) or joystick CV generated staircase etc. The S&H rate pot also doubles as a frequency control for the modulating triangle wave that can be applied to VCO1 and VCO2 wave-folding, as discussed earlier. An additional pin cable (red pin with white dot) inverts the S&H output. This is a very useful feature, it allows S&H of envelopes like the Envelope Shaper Trapezoid and then applies voltage inversion to the output. Octave shift via two front panel rotary switches giving octave shifts up to plus or minus three octaves, which greatly expands the pitch CV range of the KS. This can be applied independently to either Keyboard CV or Sequencer CV from the KS. A toggle switch allows slewing of either the KS Keyboard or Sequencer voltages in addition to octave shifts. This allows portamento to be easily applied to sequences in real time as well as fast octave shifting. The inverter is available via the white EMS pin cable with a straightforward operation of inserting the pin into the Synthi matrix. The voltage source from the matrix row where the pin is inserted is inverted before being routed to the destination column. Given that the Slew Limiter can also act as an inverter (see above), two inverters are available for use at any one time. The Expander interfaces with the Synthi AKS via the male/female 8-pin jones connectors on the main Synthi unit and KS, and the special EMS pin cable. The standard connecting cable is removed between the KS and Synthi and the unit's own cables are used instead. In the prototype unit all power was derived from the existing Synthi internal PSU. This is made possible through careful design and the use of low-current JFET opamps to minimize the total current draw. Soak testing for 24 hours continuous use and various other tests show the PSU in my VCS3 (Mk2) is beefy enough to power a KS and the Expander without being over stretched (which would manifest itself as voltage drop on the Synthi's main +12V/-9V power rails). Nevertheless, since the Synthi PSU (even the Mk2) is not a great design and also taking into account that there could be variations between Synthi AKS units out there in how good their PSUs are, I have added the option to bypass the Synthi +12V power rail and use instead a simple 12V AC/DC wall wart adapter (300mA maximum current type being more than ample). An internal regulator in the Expander gives stable +12V and provides current on the positive rail, with current drain from the the -9V rail still being derived from the Synthi. Since the Expander draws little current from the -9V power rail, the Mk2 power supply that is in all Synthi AKSs is not being put under any strain. I also plan to release a version of the Expander to be used with a VCS3 (Mk1 or Mk2) and DK1/2 keyboard. It would be built into an Afrormosia wooden case with VCS3 styling. This requires various modifications to the current Expander design as the DK oscillator appears to the matrix on Input Ch 1 and normal pitch CV on Input Ch 2. The 'DK' version of the Expander would mix VCO1/2 with the DK oscillator on Input Ch 1. This could give you up to five oscillators under DK control. The other features would work as in the KS version. More information will be posted once a prototype has been designed and built. VCO Demo Your browser does not support the audio element. S&H Demo Your browser does not support the audio element. Click on the above buttons to download a PDF of the user guide and dope sheet. The user guide is a work in progress and is not yet complete, but it will hopefully give you a good idea of the many features available on the KS Expander. In designing the KS Expander I have been inspired by circuit designs from Harry Bissell and particularly Thomas Henry in his VCO circuits based on the XR-2206 IC. The circuits used in my designs are not direct copies and are modified to interface with Synthi waveforms and 'odd' (+12V/-9V) supply voltages as well as featuring novel design elements such as VCO syncing via wave-folding described above. Also many thanks to Constantin Papageorgiadis for his testing of the original production unit and for his creative suggestions on improving aspects of the unit. These units are custom made to order and so there will be a turnaround time. Contact me to be placed on a list.